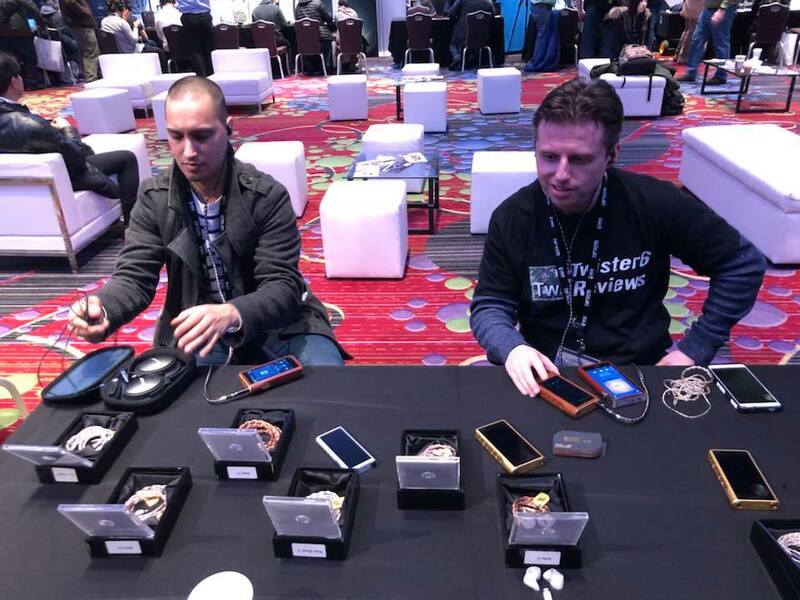 Audiophiles captured in their natural habitat! CanJam New York 2018-the Return of the Monster Show! 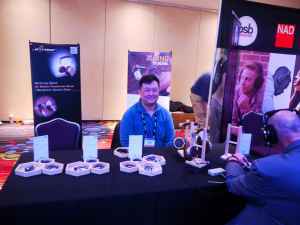 CanJam made it back to Times Square for the second year February 17-18, bringing together many of the best in the portable music world to show their wares, from old standards to new releases, in the comfortable setting of the Marriott Marquis Hotel. This year, they even managed not to conflict with the Super Bowl (a wise planning move, I’d say, though it didn’t put a major damper on last year’s show). I brought a good camera I rarely use, which was a mistake-I probably would have been better off just taking shots with my iPad. Many of the shots I took didn’t quite come out as I hoped (there is a very pretty, spacy shot of the Naim headphone amp that I kind of like, though, Naim-standard green lights swirling around the photo in a surreal display…). But, I’ll present what I have and try to convey the fun and excitement of the presentation. 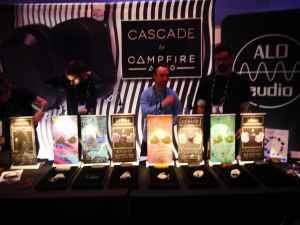 Campfire Audio had its full line up of beautiful, modern iems on display, along with a new offering, the closed back over ear Cascade, featuring premium materials, a 42 mm beryllium driver, with good open sound and bass punch, for $799. 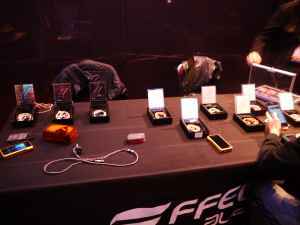 Effect Audio had their beautiful line of cables on display, along with 2 prototype cables involving a mix of metals, including palladium. The cables were different sounding, which Eric attributed strictly to the different braiding of the 2 cables. Interesting…(Effect was also the cable for the Empire series). 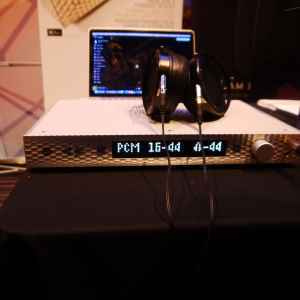 iFi showed it’s new Pre DSD ($2499), which, aside from being beautiful to look at, handles pretty much any digital file thrown at it, and can output it through solid state or tube circuits. DBravo had a line of 3 in ears they were showing, copper, Air motion tweeter/DD hybrids, which varied in nozzle material (wood, ceramic and aluminum), and sold for the not inexpensive $3k-$10k. 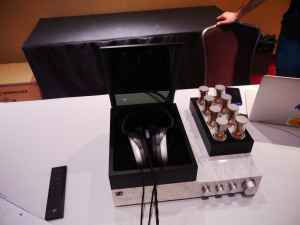 Sennheiser had a separate room to demonstrate their HE-1 top of the line system (as they did last year). 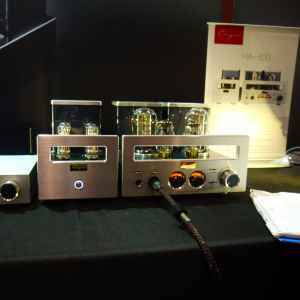 This electrostat comes with a marble tubed DAC/amp, that is visually striking indeed. The rep controlled the audition, playing solo cello Bach, Nirvana, with realistic cymbal decay and open stage (as befitted a $55k system, amp/dac and headphones. 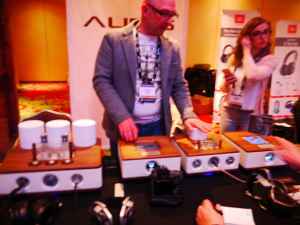 Serbian manufacturer Auris demoed their HA2 and Headonia 2A3 Headphone amps, the D1D DAC, and CD-1 CD player (remember those? 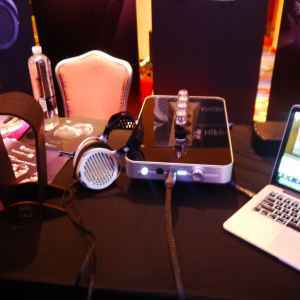 ), which are designed to look AND sound great, with tube electronics, and beautiful wood and leather exteriors. It’s always a pleasure to see Zach, and he had his new ZMF Auteur, an open back in teak ($1599), with other wood options available; as usual, the handcrafted woodwork and the sound are exemplary (hoping to get a review sample). 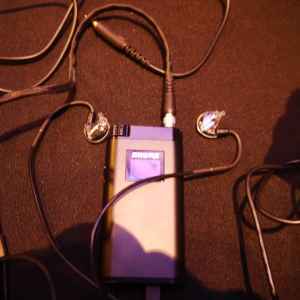 Shure had their 1540 (cans that I like), but the real draw was their in ear electrostatic KSE1500 ($3000), which was fast, detailed, open sounding…the noisy CanJam main room wasn’t the best place to hear them, but they did impress. 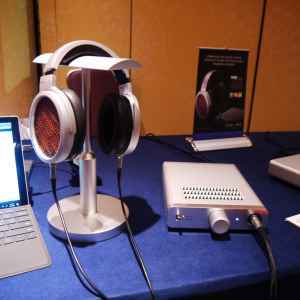 iBasso was showing their new IT04, a hybrid with 3 BA and 1 DD driver, and their DX200 and Amp4 add on amp, so beloved by our Pinky. 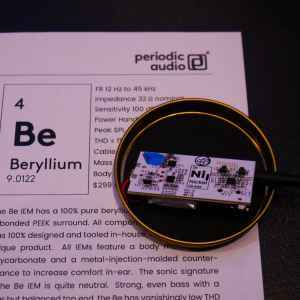 Periodic Audio showed their in ears, (Magnesium, Titanium, and Beryllium), which I had seen at last year’s show, and a new portable amp, the Nickel ($299), an amp (no dac), whose specs are150 mW into 50 Ohms, 250 mW into 32 Ohms, and 270 mW into 16 Ohms. The theory is, the limiting factor to good sound from most phones isn’t the internal dac, it’s the amp, and the Nickel attached to a phone should improve sound while having a small footprint. Sonoma Acoustics had their Model 1 electrostatic (with amp and DAC, $5k), and I got to spend a bit of time in the side room they had, listening to Bob Dylan moaning about his “Memphis Blues Again”. These folks brought lots of recording and engineering expertise to the project, and there are more models on the way. 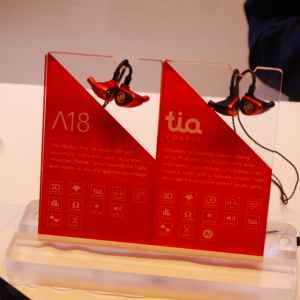 64 Audio was always very crowded, showing their A12t, A18, Tia Trio and Tia Fourte, and that crowd swelled into the main space for their giveaways! Lots of folks hankering for these babies! 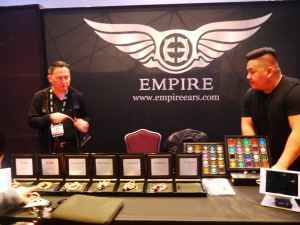 Last (but definitely not least), Mytek had their acclaimed Manhattan and Brooklyn amp/dacs on display, and 2 new units: the Liberty DAC/headphone amp (about $1k), bringing Mytek goodness to a lower price point, and the Clef, a portable amp/dac for use with a phone, making great music from an iPhone. 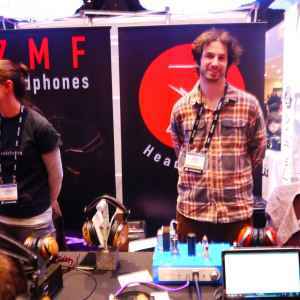 Audiophiles (Audiophilus Headphonus) captured in their Natural Habitat!